After some difficulties getting good macro shots in Tyresta I decided it was time to get a macro focusing rail. For those who don't know what that is, let me explain. When doing macro photography you have a lot more issues with focusing than usual. The problems come from the distance to the subject being comparatively small. This results two problems. First, the depth of field - the distance from the lens where an object is in focus - becomes very small, on the order of fractions of a millimeter. Second, with my setup[a] there's the other problem of the lens only being able to focus from 11cm to 12cm from the front of the lens. So what I have to do is this: First, place the camera in such a way that the subject I want to photograph is between 11 and 12 centimeters from the front of the lens. Second, adjust focus to place the focus on the right spot. The first step is harder than you may think. Indoors it is doable, but in the field it is a pain to position a camera to within one centimeter on a tripod on uneven ground. The second step also has one big gotcha: As you change focus distance on the lens, two other things change - depth of field and the effective focal length. The depth of field, already small, shrinks even further as the lens focuses from far to near. This makes even less of your composition end up in focus. The effective focal length is the focal length of the lens as actually observed, not as what it says on the lens barrel. When this changes it is called "breathing[b]". Try it - set your lens to manual focus and focus from near to far: If the edges of the frame move in or out, your lens is "breathing". Again, this changes the composition of your carefully lined up macro shot. The solution to both of these problems is to keep the focus distance set so you get the depth of field you want, and then to move the camera until the subject is in focus. A macro focusing rail is a tool that you mount the camera on in order to do this easily. Being cheap, I went for a cheap model. 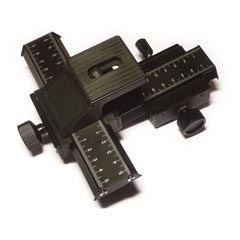 It is sold under many names: Adorama Budget Macro Focusing Rail[c], Janco Macro Focusing Rail[d], Cowboystudio Macro Focusing Rail[e] and Studiohut 4-way Macro Focusing Rail[f], among others. It turned out to be surprisingly stable. I had expected some slack in the gears, but so far - none. 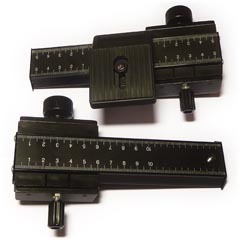 The rail really consists of two separate rails that both have a (standard camera tripod) 1/4-inch screw and a corresponding socket. The bottom block attaches to the tripod as a camera would, and the top block in turn attaches to the lower rail as a camera would, and provides the platform for the actual camera. This means that if all you want is movement along one axis, you can separate the two rails and only use one of them. The biggest downside so far is all the stuff that sticks out every which way from it: The two locking knobs (the thin knobs) and the camera mount. These make trying to pack it in a small bag for field use a nightmare and I haven't found a solution for that just yet. The locking knobs are standard M3 screws, so I'm looking at just replacing them with smaller screws; I can make do with having them set to "somewhat locked", but I can't make do with not being able to fit it into my camera bag. Here's my first attempt at focus stacking using the rail: A random potted plant. Being able to compare this to not using a focusing rail, I can say that this was a whole lot easier. I shifted the camera about a third of a millimeter between shots and then stacked it all using Hugin[g] and Enfuse[h]. The Enfuse command line was --exposure-weight=0 --saturation-weight=0 --contrast-weight=1 --hard-mask --contrast-window-size=9. As you can see, it didn't quite get rid of the out-of-focus areas; they can be seen as haloes around the buds. It does give the shot a very dreamlike appearance, though. After having used the rail in anger, I realize that it lacks one thing that would make it perfect: The ability to stop time; or at least stop the wind. I brought it with me to Tyresta, but ended up shooting hand-held. The rail did an excellent job at steadying the camera - but the wind blew the subject of the photo all over the frame, making any kind of focusing or composition impossible. So I have to give it a rating of "more hassle than it's worth" for field use. For studio work, however, it it great. The screws are precise enough to allow for positioning down to about 1/3 - 1/4 millimeter (1/100 inch). Beyond that, the two movement screws are simply not precise enough unless you have amazing cybernetic hands to rotate them with.